It happens all too often -- you're having trouble driving a screw in or getting it out when your screwdriver slips and strips the head. Now, instead of a tight-fitting slot, all you have is a slippery slope that your screwdriver can't grip. Whether you were driving the screw or removing it, the best course of action now is to extract it and replace it with another one. You'll need a drill. If you're trying to remove a screw that's locked in by rust and corrosion, you may be able to get it to turn if you dissolve the rust. Spray the screw head generously with lubricant, and give the lubricant at least 10 minutes to work. 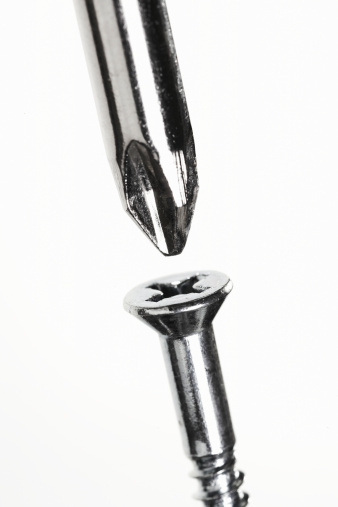 Put the screwdriver aside, and insert an appropriate screw bit into a drill -- the drill provides much more torque than you can develop by yourself. Push down on the drill with as much force as you can muster while you operate it in reverse. Once you get the screw to move a smidgeon, the rest should be easy. Cover the screw head with a rubber band and rubber glove, and push the drill bit into the rubber while operating the drill. Tap the drill bit into the screw head with a hammer before inserting the bit into the drill. Grip the screw head with locking pliers and turn the screw with the pliers. Glue a nut to the screw head with epoxy glue. When the glue sets, turn the nut with a wrench. Drill a 1/8- to 1/4-inch hole in the head -- depending on the size of the screw -- using a metal-boring bit. This hole needs to be about 1/4 inch deep. Remove the bit from your drill. Insert the tip of the extractor in the hole you drilled, and tap it in with a hammer. Fit the drill over the extractor and secure it with the drill chuck. Push down on the drill while operating it in reverse at low speed. The extractor's spiral threads should grip the metal and force the screw to move.